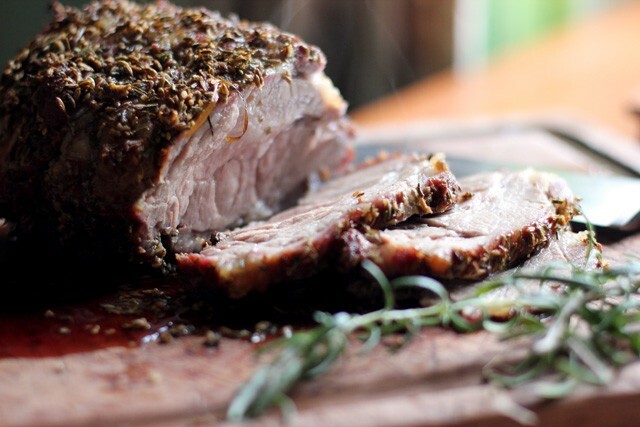 Garlic and Rosemary Pork Roast uses Earls pork loin boneless roast. Don't be surprised when guests start asking for seconds. Using a small electric food chopper, finely chop garlic and rosemary. In a small bowl, combine chopped garlic and rosemary with oil, vinegar, salt and pepper. Spread mixture on all sides of roast. Place roast on rack in a shallow roasting pan. Roast uncovered at 325°F (160°C) until meat thermometer registers 155°F (68°C), about 1 to 1 1/4 hours (internal temperature will rise to about 160°F/71°C). Remove roast from oven and cover loosely with foil. Allow roast to rest 10 minutes before slicing.